Calling all citizen scientists! The "Rusties" need you! It’s basic black with an inelegant voice. It nests in places we rarely visit. And in relative obscurity, the Rusty Blackbird has suffered one of the most dramatic population declines ever recorded among our songbirds. The International Rusty Blackbird Working Group, a coalition of biologists and conservationists, is recruiting birdwatchers to track them during the "Rusty Blackbird Spring Migration Blitz." It’s happening right now! If you’d like to help the “Rusties” recover, check out Related Resources below. It’s basic black with an inelegant voice. It nests in places we rarely visit. And in relative obscurity, the Rusty Blackbird has suffered one of the most dramatic population declines ever recorded among our songbirds. “Rusties” breed in bogs, swamps, and other wetlands across Canada and just barely into the northeastern US. [general wetland ambient, dawn chorus] We mostly encounter them northbound during March and April – and southbound in fall. But we’re seeing far fewer. During half a century, as Bald Eagles and Peregrine Falcons recovered, Rusty Blackbird numbers plunged by an estimated 90 percent. Loss of swamps in the southeastern US, where they winter, probably explains part of the decline. Other causes might include mercury poisoning and the warming and drying of wetland breeding sites. It’s also likely that we overlooked their decline. Blackbirds are generally abundant and resilient. They don’t get the same attention we devote to gutsy falcons or vibrant warblers. 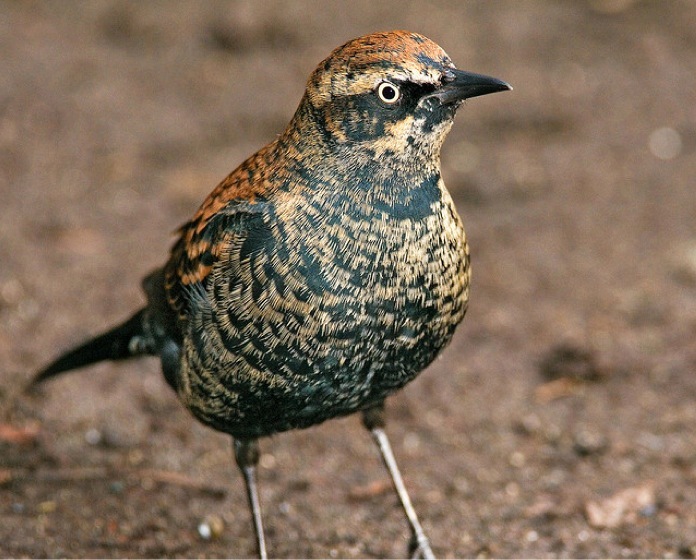 But the International Rusty Blackbird Working Group, a coalition of biologists and conservationists, is recruiting birdwatchers to track these songbirds during the "Rusty Blackbird Spring Migration Blitz." It’s happening right now! If you’d like to help the “Rusties” recover, begin at birdnote.org. Mild wetland ambient drawn from  recorded by R.W. Simmers in Maine. Learn more about the need for citizen scientists!